4. 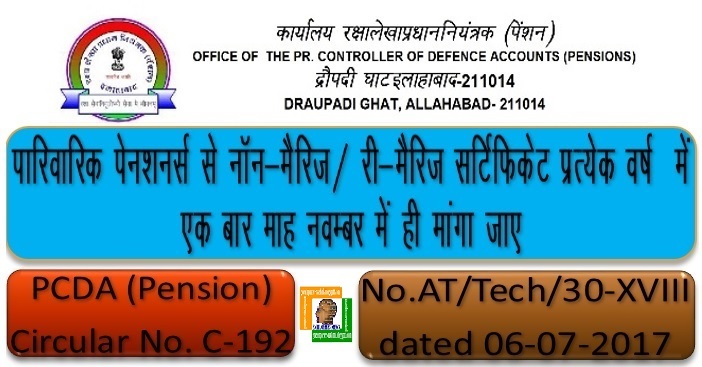 The CDA (PD) Meerut ……..
6. The Nodal Officers (ICICI/ AXIS/HDF C Bank)…………..
7. The Pay & Accounts Officers ………..
Sub: Difficulties being faced by the Family pensioner at the Pension Disbursing Agency (PDA) about furnishing of Non-Marriage Certificate. 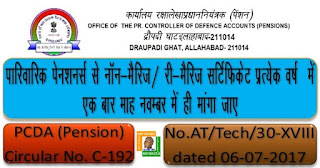 Instructions for payment of family pension and submission of Non-Marriage/Re-Marriage certificates from defence family pensioners (including Defence civilian family pensioners) are provided in Para 39 of DPPI-2013 and para 12.3 & 12.4 of Scheme for Payment of Pension of Defence Pensioner by Public Sector Banks revised edn. 01.01.1987. Periodicity of submission of Non-marriage/ re-marriage certificate for various kinds of recipients of family pension is different. Difference in periodicity of submission of certificate was a cause of inconvenience to the family pensioners and was attracting representations from various agencies. Accordingly, the matter was referred to the competent authority to consider the periodicity of submission of Non-marriage/ re-marriage certificate for all kinds of recipients of family pension as once a year. The competent authority has advised that certificate may be sought for from the family pensioners at the time of annual identification. In view of the above, all the pension disbursing authorities are advised to seek submission of non-marriage certificate from all kinds of recipients of family pension at the time of annual identification (i.e. in the month of November each year). 2 The Pr.CDA (Navy), Cooperage Road Mumbai. 4 PA to CDA (AT) / CDA (Gts)/CDA (DPTI) in Main Office. 5 PA to all Add]. CDA / Jt.CDA, in Main Office. 6 All GOs, in Main Office. 7 Officer-in-Charge, G-I/ M (Tech), G-I/C (Tech) and. Gts /Tech Section (Local).